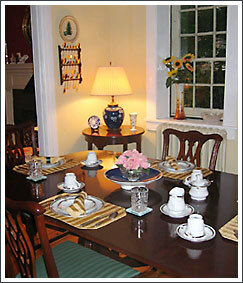 In addition to being a unique Bed and Breakfast, the Georgian House is Ann and Tom’s home. 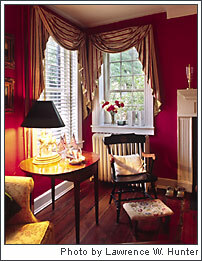 One of the oldest residences in Annapolis, it predates the American Revolution and reflects the spirit of a new nation. 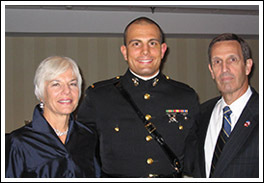 Guests from around the world often find themselves welcomed by a Midshipman from the United States Naval Academy (as they have been for over 75 years). Annapolis has something for everyone, as does the Georgian House. Imagine spending the night in a 260 year old home once used by three of Maryland’s signers of the Declaration of Independence! 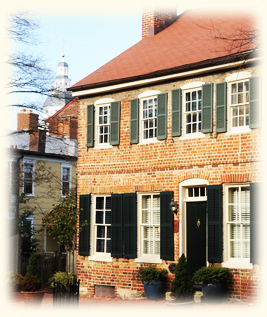 Located in the heart of the Annapolis Historic District, the Georgian House Bed and Breakfast was frequented by members of the Tuesday and Forensic Clubs. 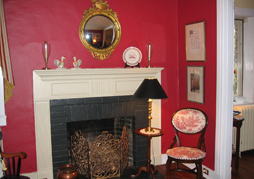 You too can enjoy the spirit of the times by relaxing in the front parlors, adorned with original red pine flooring, working fireplaces, period family treasures and antique furnishings. Our four guest rooms have all been newly decorated and are attractively furnished with unique colour schemes, coordinated fabrics, and old-world charm. The luxurious queen-sized beds have distinctive, hand-made comforters and are fitted with soft 100% cotton sheets to ensure an exceptionally restful sleep. The private baths (and 16 inch brick walls) maintain privacy and quiet throughout the house. Each room has its own television (with on-demand movies) and there is wifi throughout. The second-floor guest library includes a large selection of books and games as well as a refrigerator and microwave. The Georgian House Bed and Breakfast is centrally air conditioned, and discounted convenient parking is available. Start your day with early coffee or tea while reading the morning paper in the parlor (or on the brick patio in the warm spring weather…a perfect spot to enjoy the English-style gardens). Then join the other guests for Ann’s delicious breakfast, featuring such gourmet treats as Dutch apple pancakes, home-cured Canadian bacon, fresh seasonal fruits, morning-fresh muffins, and locally roasted Colombian coffee. And after your refreshing and relaxing visit, treat a friend with one of our gift certificates!! Upcoming Events in Annapolis | Recommended Parking Garage.